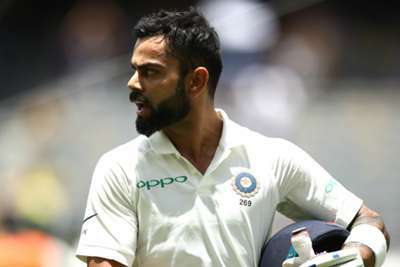 Kohli added to his overnight 82 to score his 25th Test hundred, but was given out on 123 as Peter Handscomb looked to collect a catch at second slip off Pat Cummins. The soft signal was out and replays were inconclusive as to whether Cummins actually got his fingers under the ball. A clearly unhappy Kohli trudged off and India soon collapsed, Mohammed Shami and Ishant Sharma quickly departing the crease as India lost three wickets for three runs, slumping from 251-5 to 283 all out in response to Australia's first-innings 326 in Perth. Aaron Finch was forced to retire hurt on 25 in Australia's second innings after being struck on the right glove, though scans have ruled out serious damage. Despite that blow, Usman Khawaja's unbeaten 41 helped them to 132-4, a lead of 175, at stumps.